Each time I teach it, I find this to be beautiful material. My goal is to strike a balance between theoretical analysis, concepts, computer-aided exploration, and applications. 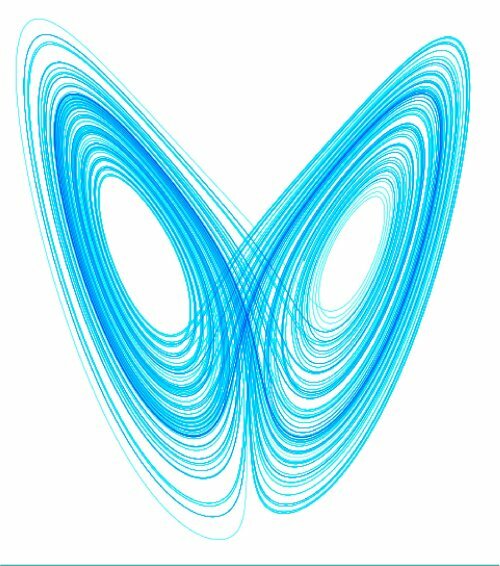 The impact of nonlinear dynamical systems on science continues to be far-reaching, including the physical, life and social sciences, engineering, finance and mathematics, and therefore we expect this course to be of interest to students in a broad range of majors who have a mathematical background in linear algebra and differential equations. Nat Adams: Swinging Atwood Machine. Paula Chen and Aaron Lewin: Numerical Analysis of the Dynamics of Single and Double Spring-Pendulum Systems. (codes: 1, 2, 3). Ethan Klein: Played By the System: Chaotic Games and the Death of Foresight. Luis Martinez: Stability Analysis of Spherically Symmetric Solutions to the Klein Gordon Equation. Kate Royce: Numerically Approximating Stable and Unstable Manifolds for Discrete Dynamical Systems in Two Dimensions. Dan Salas: Chaos in Exchange Rate Models. Lectures / OH: Haldeman 028, Tu+Th 10-11:50am ("10A" slot), crucial to attend since we'll do lots of worksheets together. I recommend you try to read some of the book in advance of the lecture. X-hour is W 3-3:50pm, and I will use intermittently for: Matlab sessions, review, problem-solving sessions, etc (ie do not schedule anything regular in this X-hr). I encourage you to come to office hours: 10-11a M, 1-2p Tu, 5-6p W.
For those waiting for it to arrive: Ch. 1 only and respective hints/answers. Homework: 7 weekly HWs due Thursdays at start of lecture. I strongly encourage you to collaborate, and to try at least some of the relevant homework problems before the next lecture (leaving it all for Wednesday night risks you getting left behind in this fast-paced course.) Please make your working/reasoning as clear as you can, write clearly, don't be scared of using lots of space on the page, and staple your work. Late homework will not be accepted (unless by prior arrangement for a valid, and exceptional, reason), but your lowest HW score will be dropped. Exams: I will try to give you ample time to complete exam questions. This course has no final exam so the 2 midterms are important. Practise is key (also see this). Project: Mainly in the last 3 weeks you will work (possibly in groups of 2-3) and research in detail a topic, usually a mix of background reading and computer experimentation, and present it in class, along with a short (5-page) write-up. It is a sizeable fraction of your course grade. Here's a preliminary list of topics and details. Project topics should be chosen by Tues Oct 20, a 1-2 page description and plan with references is due Tues Oct 27, and in-class presentations Tues Nov 17 (continued Wed Nov 18). Final write-up will be due around the weekend - date TBA. Special needs: I encourage students with disabilities, including "invisible" disabilities like chronic diseases and learning disabilities, to discuss with us any appropriate accommodations that might be helpful. Let me know asap, certainly in first 2 weeks. Also stop by the Academic Skills Center in 224 Baker to register for support services. Private tutoring: Tutor Clearinghouse may have private one-on-one tutors available for Math 53 (although for this course, offered in alternative years, they may be hard to find: either they took the course or are advanced or grad students). If a student receives financial aid, the College will pay for three hours of tutoring per week.